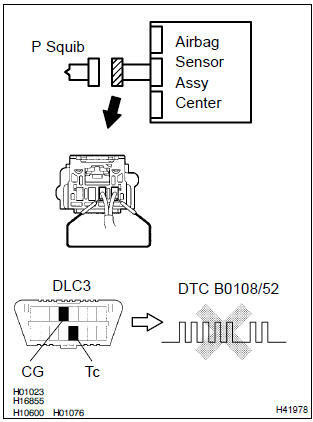 disconnect the connectors between the airbag sensor assy center and the instrument panel passenger airbag assy. 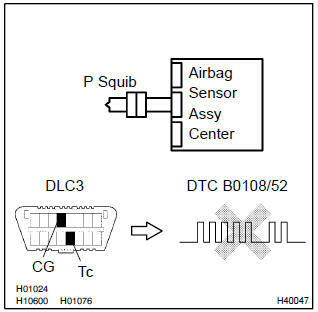 for the connector (on the instrument panel passenger airbag assy side) between the airbag sensor assy center and the instrument panel passenger airbag assy, measure the voltage between p+ and body ground. 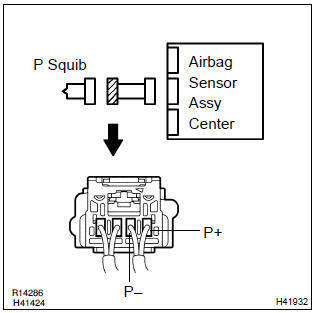 using a service wire, connect p+ and p– of the connector (on the instrument panel passenger airbag assy side) between the airbag sensor assy center and the instrument panel passenger airbag assy. Ok: dtc b0108/52 is not output. : codes other than code b0108/52 may be output at this time, but they are not relevant to this check. connect the instrument panel passenger airbag assy connector.